In cases where an image based PDF file has not been OCRed already or fails to OCR for some reason, you can set it up manually for a Re-OCR. •Right click and select Properties. •Select the checkbox next to Re-OCR and click on Apply button. This will mark the file for OCR and will be OCRed again on the server side as per the schedule time set by the Administrator in Docsvault Server Manager. 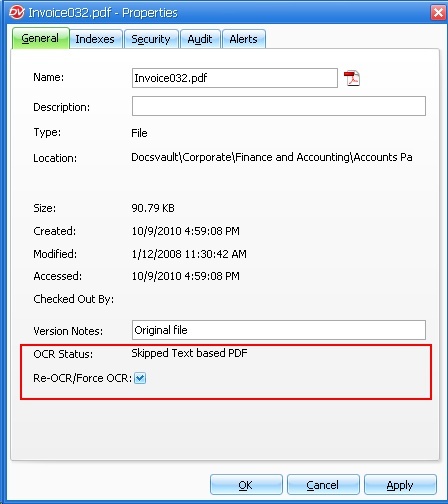 Administrator can monitor the process from OCR node in Docsvault Server Manager and mark files in bulk for the re-OCR process.